4 On page optimization Blogging tips To Get Traffic From Google Search results or to get organic search results from search engines. 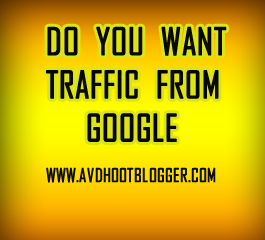 Page rank and Alexa rank also depend on the amount of traffic that you receive for your blog. And if you have Google Adsense ads then earnings will also be higher if you receive Google search results. So below are those methods that I use to receive Google search results or say use to get traffic from Google search engines. Use h1 tag when you write a little description about your posts. Search engines like Google, Yahoo loves h1 tag and whatever you type in between the h1 tags brings you traffic. You can check out many of the famous blogs who use h1 tags and it brings them traffic. Do not out too many keywords in h1 tags. But use only 1 or 2 that matches with your post title and you will see getting traffic from search engines. Post title before the Blog Homepage Title. Use post title before the homepage title. 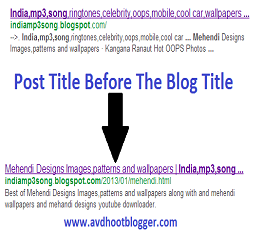 Many times you have seen your blog title appears before the homepage title which is not good from SEO point of view. If you want to receive traffic from search engines then put your post title before the homepage title. You can do this here. I have written all the required codes which will put your post title before the homepage title. The post title before the homepage title. Use Caption and Properties On images. In order to receive traffic from Google images, you need to put captions and also use properties of images which indicates search engines like Google and Yahoo about the description of images. Anytime a user types a keyword that matches with your images caption or properties then your images will start appearing in Google images search results. So use effective keywords in your image captions . Make bolder your anchor text and link them in a blog post. Always use anchor text in your blog post and link them to your related posts and make them bold. Google bots find bolder keywords in your blog post and if your anchor text matches with user query then you will start getting traffic from Google search results. And the moral is make search engines easier to find the keywords in your blog posts. So always make them bold. For example my anchor text is blogging tips so see in the above image I have made blogging tips bolder. Blogging Tips For Post title before the homepage title. How to create mobile apps of blogger blog. Blogging tips to find the widget id of any blogger widget. Jump to widget feature in a new blogger update. Google plus pop up box widget for blogger. Description : 4 On page optimization Blogging tips To Get Traffic From Google Search results or to get organic search results from search engines.